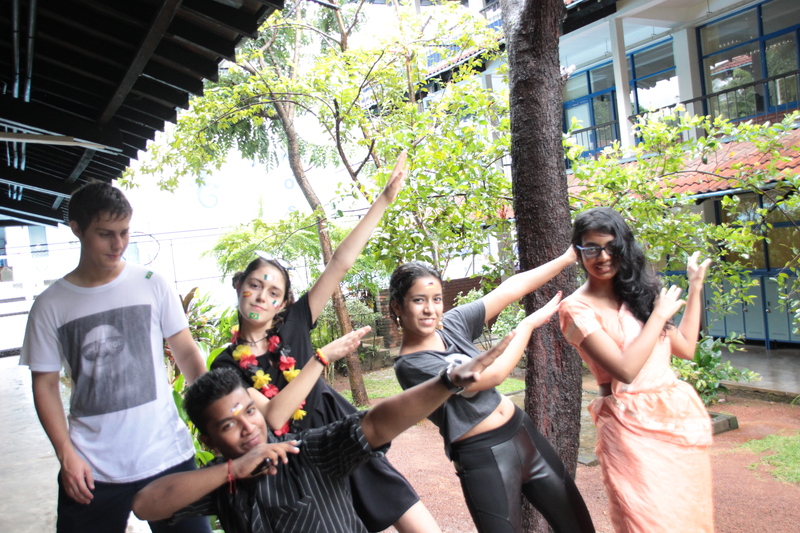 On 9th October 2015, the day before the mid-term break, we celebrated United Nations Day in the Overseas School of Colombo. As OSC is an international IB school, with over 45 different nationalities, UN Day is an important and well-appreciated event that is commemorated with many different activities. My favorite thing about UN Day is that everyone comes to school in their national dress. I came to school in the Kandyan saree, the national dress of Sri Lanka; it was my first time wearing this kind of saree, and although I may have tripped once or twice while walking around school, I felt really proud to be a Sri Lankan and share my culture with the other students. I also really enjoyed seeing what my friends and classmates were wearing; I ended up learning about their culture and the effort they had put into representing their countries added to the enthusiasm of the celebration. After we arrived in school, we headed outside for the flag parade and introductory assembly. 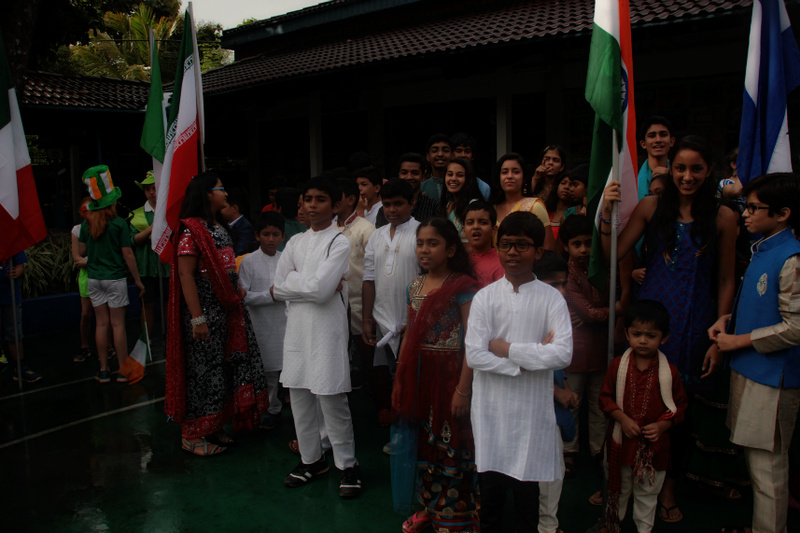 For the flag parade, the oldest student of each nationality carried their flags, and were followed by other fellow classmates of the same nationality. It was a beautiful and colorful event, and although it started to rain, we made it to the gym for the assembly without a hitch. At the assembly, the Universal Declaration of Human Rights, adapted by the UN General Assembly in 1948, was addressed, giving me a deeper appreciation for UN Day. In addition to celebrating our diverse backgrounds and cultures, UN Day also commemorates our ability to communicate and collaborate together in order to ensure that all humans are treated equally. After the inspiring introductory speech, those of us in secondary school returned to our assigned classrooms in preparation for discussions about global issues that may concern the UN. Each group consisted of a mix of Grade 10, 11 and 12 students, meaning that our discussions had many different perspectives and mindsets. These discussions were led by MUN students, and after an informative presentation, our group started discussing our debate topic: ‘Should marijuana be legalized?’. This is a controversial topic in the current world, especially as certain countries and states have already legalized this drug. Before this discussion, I had given this topic some thought, and was firm in my opinion that it should not be legalized. Throughout the discussion, however, I was surprised, and interested, to learn that there were some compelling and reasonable arguments for the legalization of marijuana, many of them related to economical benefits such as a reduction in the black market for the drug. After giving my opinion about the situation and listening to what others had to say, I realized this was a matter that had to be given a lot of thought, and although I still stand with my previous stance, I now realize much more reflection has to be put into such a decision. After that heated discussion, I was eager for the UN Day food stall, organized by the PTA who had generously provided us with a variety of delicious and diverse food. The rain, which had decided to once again pour down at that fateful moment, did not stop most of us from running between the food stalls located outside, sampling all the different types of food available. Although it was not easy running around in the rain in a saree, the food really made it worthwhile. To end the day, we all gathered in the auditorium for the final assembly. As I got there slightly early, I helped the MUN students, who did a majority of the organizing for this event, by welcoming parents and classmates at the door to the auditorium. During this assembly, we had a keynote address by US Ambassador Atul Keshap and an enlightening speech by an invited speaker, Una McCauley who is the Sri Lanka country representative for UNICEF. Both speakers gave me insight into the UN and emphasized the privilege we have to go to an international school and interact with such diverse people. In addition to these speeches, many of our classmates performed cultural dances and compelling theatre pieces, which provided the perfect ending for such an eventful UN Day. I think the UN Day was a great way to start the mid-term break as it reminded us of the privilege of attending an international school and getting to collaborate and communicate with many nationalities in order to strengthen our understanding of, and contribution to, global issues.